Scott Berry is one of five children. But he and his youngest sibling, David, share a very unique bond — a kidney, to be exact. 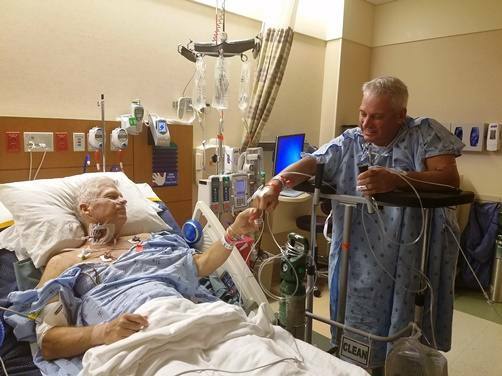 On April 12, 2016, David gave his older brother a second chance at life by donating one of his kidneys to Scott for a transplant. Fifteen years ago, when Scott moved to Florida, he was diagnosed with IgA nephropathy, a rare autoimmune disease that causes inflammation of the kidneys that affects the kidney’s ability to filter waste, excess water and electrolytes from the blood. “IgA nephropathy is the most common form of glomerular disease in the world. It essentially is damage caused by abnormal immunoglobulin A in the kidneys’ filtering units, called glomeruli,” explains Martin Mai, M.D., a nephrologist and chair of the Division of Transplant Medicine at Mayo Clinic’s Florida campus. Although Scott didn’t have any major symptoms, the Fleming Island, Florida, resident experienced extreme fatigue on a regular basis. He saw his local nephrologist every six weeks and was given heavy doses of prednisone. But over time, the disease progressed, and Scott was close to kidney failure. In September 2015, his doctor advised that to avoid dialysis, Scott would need to be evaluated for and approved for a kidney transplant. Physicians said that there are two options for kidney transplants: a deceased donor and a living donor. The median wait for a deceased donor kidney is about three-and-a-half years. A living donor transplant — where a living person donates an organ — offered a shortened wait time and would keep Scott off dialysis. Other advantages of a living kidney donation include better long-term outcomes and less rejection risk, especially if a match is from a family member. There are 5,000 to 6,000 living kidney transplants performed annually in the United States. Physicians at Mayo Clinic’s Florida campus perform 30 to 45 living kidney transplants each year. Knowing the lengthy wait his brother may have on the national transplant list, David was the first family member to step forward and undergo testing to see if he could be a donor. David underwent a variety of tests to determine if his kidney would be compatible for his brother. Scott says he is humbled by the entire transplant team and the process, which all came together to give him his life back. “I’m the recipient of all these people coming together: donor, caregiver, nurses, PAs, doctors and other members of the transplant team. I was the one in need and all these people came together within Mayo to make the process work,” Scott explains. 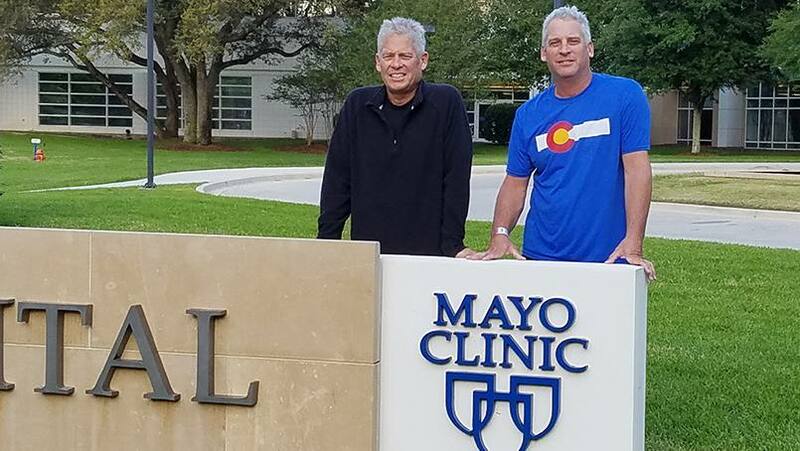 “I am beyond grateful to live in a community where I have access to a facility like Mayo Clinic that has such outstanding employees who truly care about the journey to better health,” he adds. Both say the actual surgery was relatively uneventful. They only stayed hospitalized for two days after the transplant. Scott, however, had daily follow-ups for the first month and credits his wife for helping ensure his recovery. “It’s amazing how important your caregiver is and how they take of everything, including keeping me on schedule with my medications. Dawn was the one that kept me in line, making sure I rested and didn’t do anything to compromise my health,” Scott says. “Caregivers are the ones who keep the success of the transplant moving in a positive direction,” he adds. Prior to the transplant, Scott wasn’t able to eat a lot of protein or potassium because his diseased kidneys could not eliminate waste. This resulted in a buildup of toxins and potassium in his body. Shortly after surgery, Scott was able to begin eating foods he hadn’t enjoyed for a long time, including eggs, steak, potatoes and bananas. The result, he says, was feeling more energetic. Within two months, he was able to return to work as a regional sales manager for a company that sells speed enforcement products to law enforcement departments. Nearly six months after his transplant, Scott says he feels great. David, who snowboards and plays basketball and softball, says he is as active today as he was before donating a kidney to his brother. He thinks the biggest misconception about organ donation is that there are long-term effects. David adds that one of the biggest surprises for him is how many people want to talk about living donation and his experience. He adds that he tries to remember the little things every day. Learn more about chronic kidney disease and IgA nephropathy. Connect with others talking about living and giving in the Transplant group on Mayo Clinic Connect. Learn more about living donation in our Living Donor Toolkit.